1.ESSAR SHIPPING LTD is a 10 rupee face value shipping stock.Essar Oilfields Services provides contract drilling and related services to oil and gas companies worldwide, operating both offshore and onshore. It owns a fleet of 16 rigs, which includes one semi-submersible rig and 15 onshore rigs. 2. Book value of ESSAR SHIPPING LTD is 250.85 annd stock traded at 15.28 so this is a value buying. 4. 52 week high of ESSAR SHIPPING LTD is 24.80 and 52 week low 13. 5. 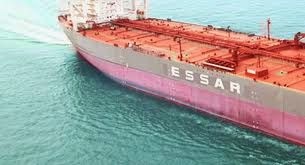 ESSAR SHIPPING LTD never give a dividend. 7. I have no any share of ESSAR SHIPPING LTD.